The next time you're at an outdoor event, make sure to keep an eye out for the new Boating Skills Virtual Trainer. The trainer is a partnership between the S.C. Department of Natural Resources (DNR) and Pioneer Boats and it makes learning basic boating skills easier than ever. 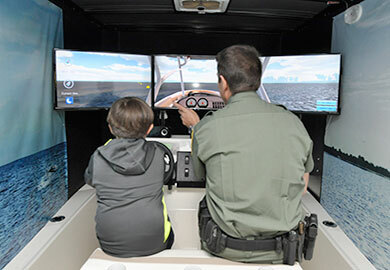 With the assistance of Pioneer Boats, DNR was able to place three 32 inch screens on an actual center console boat, mounted insider a trailer, for a virtual boating experience like none other in the United States. Steering, throttle and other controls are exactly like those found on a real boat. The instructor has the ability to tailor the student's experience by adjusting everything from wind and current strength to even day/night scenarios. The simulator offers several learning platforms through which students they can learn about docking, mooring, pivot turns and more on a virtual waterway free from the hazards that can occur on the water.